Pesticides are chemical substances designed to be toxic to organisms that affect plants’ growth such as fungi, insects or weeds. However, while pesticides help farmers to grow food in a more intensive and simple way, this generates many externalities as they cause the death of many wildlife species including mammals, earthworms and bees. Historically, some of the most toxic, persistent pollutants released into the environment have been pesticides (e.g. DDT, dieldrin, agent orange). Their toxicity and capacity to accumulate in soils and in the food chain was discovered after decades of use in agriculture and these pesticides have played a key role in the degradation of the natural resources, habitats and biodiversity that we experience today. 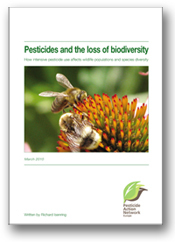 Our pesticide-intensive agricultural model has been identified as a major cause of biodiversity loss. "“Pesticides can persist in the environment for decades and pose a global threat to the entire ecological system upon which food production depends. Excessive use and misuse of pesticides result in contamination of surrounding soil and water sources, causing loss of biodiversity, destroying beneficial insect populations that act as natural enemies of pests and reducing the nutritional value of food.” stated the UN Report of the Special Rapporteur on the right to food. In the EU, the Plant Protection Regulation (PPR) (EC) No 1107/2009 recognises that pesticides have played a key role in the environmental degradation we witness today. One of its purposes is "to ensure a high level of protection of both human and animal health and the environment’ (Rec. 8)” and requires that “pesticide use should have no unacceptable effects in the environment and its ecosystems [art 2(b,c)]”. PAN Europe works to protect the pollinators, secure the partial ban of neoniconinoids that harm them and widen it, prevent the abuse of the derogations by the EU Member States. PAN Europe's work also focuses on the contamination of European freshwater systems by pesticides, giving a special emphasis on the effects of endocrine disrupting pesticides on aquatic ecosystems. To learn more, read our factsheets, see our publications and presentations.